Jammu and Kashmir, the ‘Jewel in the Crown of India’, is one such place that can pleasantly infect you with its enchanting beauty and magical charm! Cossetted in the lap of the Indian Himalayas, this mesmeric destination attracts thousands and millions of travel bugs from all across the globe. Within this Magical Ladakh Tour from Srinagar, you will get to explore, discover and feast on the bewitching beauty of some of the most scenic destinations in Jammu and Kashmir. Originating from the state capital city, Srinagar, this amazing and equally fun-frolic tour meanders across other popular places like Leh, Kargil, Gulmarg, Sonamarg, Pangong Tso Lake, and several others. Within the 10 days of this Magical Ladakh Tour from Srinagar, you will get introduced with the colourful cultures and traditions that makes Ladakh a must visit place in Jammu and Kashmir tourism map. Delight in the fun-frolic of this Magical Ladakh Tour from Srinagar with your arrival in Srinagar. 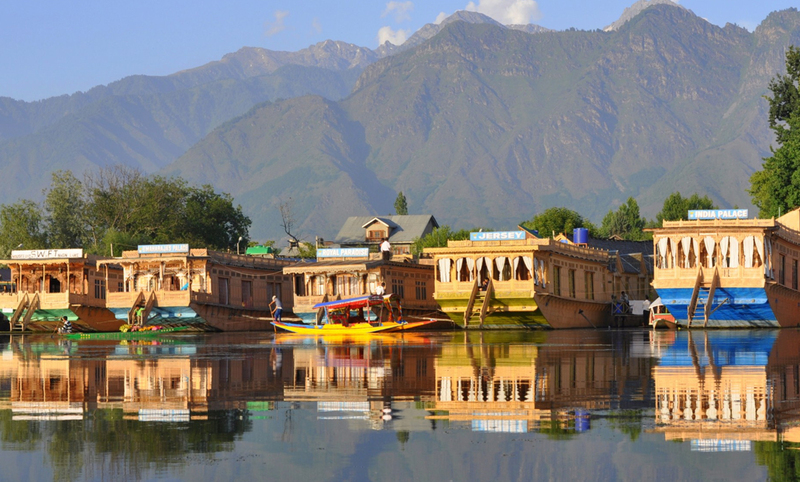 As you arrive in the city of Dal Lake, shikaras and Mughal Gradens, our tour representatives will greet in you and get you checked-in into hotel or a houseboat. After getting freshened up, you will be guided for a half day excursion to the scenic Mughal Gardens. During this excursion, you will be visiting NishantBagh, Shalimar Bagh, and few of the other vibrant gardens on the banks of the pictorial Dal Lake; most of these gardens were built under the commission of Mughal emperor Jahangir. Post this visit, you will be touring around ChashmeShahi, Botanical Garden and the renowned Pari Mahal. The day will wind up with an exciting Shikara ride in the enchanting Dal Lake followed by your overnight stay. Waking up in the morning; after your breakfast, you will be picked up from the hotel or the houseboat for an enthralling drive to Pahalgam or the ‘Valley of the Shepherds’. On your way to this gorgeous valley, you will be visiting the picturesque saffron fields, Avantipura Ruins, cricket bat factory in Avantipura, and the sulphur springs in Anantnag. Driving further, you will be reaching the Valley of Shepherds by early noon, and will be free to discover the magnificence of the Lidder Valley at your own. Post this, you will be having two different options to make your day memorable. Option 1: You can embark on a visit to a quaint village called Aru Valley on the upper banks of the Lidder River. Located around 15km from Pahalgam, this gorgeous hamlet is the origin of the stunning Kolahoi Glacier. Option 2: If not the first option, you can also opt for a visit to Chandanwari, which is around 16km from Pahalgam and is extremely popular for activities like snow sledging and is also the origin of the pious ‘AmarnathYatra’. On your way to Chandanwari, you can also visit the pictorial Betaab Valley, the shooting ground of Hindi popular film ‘Betaab’; this spot is also a popular day-picnic spot among the visitors to Chandanwari. Option 3:You can also enjoy a leisurely stroll around the evergreen pine forests along the gurgling Lidder River and revel on an exciting riverside day picnic. Option 4: The last option will take for an amazing and equally exciting pony ride to an imposing meadow called Baisaran. Tucked away amidst snow-clad peaks and pine thickets, this meadow offers astounding panoramic views of Pahalgam along with the Lidder River. Upon the completion of this excursion, you will be driven back to Srinagar for your overnight stay. Today morning, after having breakfast in Srinagar, you will be driven to the ‘Meadow of Flowers’ or Gulmarg. Seated at an altitude of 2,730m, this gorgeous hill station in Jammu and Kashmir is revered as one of the most fascinating skiing destinations in the entire world, and is also the home to one of the highest golf courses across the globe. Arriving in Gulmarg, you will be free to embark on a leisurely walk around its scenic vista and enjoy its miraculous beauty. If weather permits, you can also catch the glimpses of the captivating Nanga Parvat and enjoy an exhilarating gondola ride (ropeway cable ride) during the day. You can also opt for a fun-filled pony ride to Khilangmarg at your own expenses or can embark on a short trek of 3-4 hours to Khilangmarg. Upon completing all these exciting activities, you will be driven back to Srinagar for your dinner and overnight stay. Waking up in the morning, you will be picked up from the hotel, and will be driven to Sonamarg. Also called the ‘Meadow of Gold’, your drive to Sonamarg valley will take you through some of the most rugged and exhilarating trails; en route, you will be visiting several villages including the scenic village of Baltal which is cossetted by snow-capped peaks and other natural marvels. Driving past the Baltal village, you will be reaching the towering Zoji La Pass at a height of 11,500ft above the sea level. Crossing this mountain pass, you will be reaching the stunning Drass Valley, which is jotted with scenic landscapes and rustic mud huts. A visit to Drass Valley is synonymic to revisiting time; you can enjoy a delicious lunch at your own expenses while in here. Driving further, you will be reaching a check-post, and after getting your documents checked here, you will be finally driven to Kargil. Arrival in Kargil will be followed by your checking-in into a hotel for your dinner and overnight stay. Today, you will be stepping on the magical lands of Ladakh with a drive from Kargil to Leh! After having breakfast at the Kargil hotel, our tour representatives will pick you up and get started with a 6-7 hours’ drive that will take you to the mesmeric city of Leh. On your way to Leh, you will also be visiting the pious Lamayuru Monastery, Sangam Point, Alchi Monastery, Gurdwara Patthar Sahib, and the gravity defying Magnetic Hill. Upon completing these visits, you will finally reach Leh city; you will be checked-in into a hotel for your overnight stay. The ‘Place of Freedom’, Lamayuru Monastery is one of the largest and most sacred monasteries in Ladakh. Located around 127km from the heart of Leh, this religious enclave was established in the 11thcentury and belongs to the Red-Hat sect of Buddhism. According to the legends, this monastery was built by the Ladakhi king and was later donated to the religious leader. The monastery buildings were exempted from all sorts of taxes and thus is was called the ‘Place of Freedom’. This sacred monastery in Ladakh is famed as one of the most ancient Buddhism learning centre in the entire of Ladakh. Located with the Alchi hamlet, unlike other monasteries in Ladakh, Alchi Monastery is located on a flat ground and was built in the 12th century. On a visit to this holy site, you can also visit a temple dedicated to Mnajushri, and can witness intricate as well as captivating murals, wall paintings, ancient scriptures, and lot more. On a visit to this museum by the Indian Army, you can pay homage to the brave Indian soldiers who sacrificed their lives while protecting the honour and dignity of their motherland. A one of its own kind museum in the country, it also houses biographies of the martyrs, seized arms and ammunitions, images and dresses worn by the soldiers during the warfare. This holy gurdwara is one of the highest religious places among the Sikhs in the world. Dedicated to Guru Nanak Dev, it is around 25km from Leh city, and was sanctified by the Guru himself. Legends have it that hearing the pleas and agonies of the locals, the Sikh Guru arrived in this place by following the routes to Nepal, Sikkim, Tibet and Yarkand. With his arrival, a local demon got raged up and planned to kill the Guru. In return, the holy Guru turned the demon into an honest man who later led his life at the service of humanity. Holy Gurdwara Patthar Sahib was built to commemorate the life and teachings of Guru Nanak Dev. Ladakh is a land of mist and mysteries; the Magnetic Hill is one of the natural mysteries in Ladakh! A hill that defies all the laws of gravity by pulling all the vehicles upward, a visit to Magnetic Hill is must during any Leh Ladakh tour. As the sweet water of the gurgling Zanskar River meets the salt water of the Indus River, it gives birth to a magical view called the Sangam Point in Ladakh. Mystique in its own ways, this site is ideal to be visited during the winters when the Zanskar River tends to freeze down while the Indus River flows with full glory! On this day, you will be driven to one of the most scenic valleys in Ladakh – the Nubra Valley or the ‘Valley of Flowers’! The drive will commence early in the morning and will take you through the towering Khardung La Pass or the highest motorable pass in the world at 5,602m above the sea level. Arriving in Nubra Valley, you will be transferred to Hunder village, where you can feast on the irresistible charm of the sand dunes along with enjoying an exciting double-hump Bactrian camel ride; camel rides can be arranged at your own expenses. If the day permits, you can also embark on a walking tour across Hunder village and the religious Diskit Monastery. Following these visits, you will be checked-in into a deluxe campsite for your overnight stay. The highest motorable pass in the world, Khardung La Pass is seated at an astounding height of 18,390ft above the sea level. Only 39km from the heart of Leh city, this pass is also one of the most sought after destinations among the visitors to Ladakh. Mountain biking, jeep safari, walking tours, nature trails, photography tours, day tours, etc. are some of the most popular activities around the Khardung La Pass. The headquarter of Nubra Valley, Diskit Village is a home to several tourist attraction sites and places to visit in Ladakh. Established in and around 1420AD, this pious site is a sub-branch of the Thiksey Monastery in Ladakh, and is a major site to visit while touring around Nubra Valley. Home to more than 100 monks and religious leaders, it is also the host ground of the gala Gustor Festival that is celebrated on the 20th and 21st day of the 12th month in Tibetan calendar. An oasis in the arid deserts of the scenic Nubra Valley, this gorgeous village is known for its enchanting sand dunes and scenic vistas. Visitors from all across the globe throng this picturesque village to enjoy camel safaris, dune bashing, stargazing, overnight camping, and lot more. Today morning; with the completion of your morning meal, you will be driven back to Leh. The drive will once again take you through the great Khardung La Pass and will wind up on reaching the main city limits by noon. On arrival in the city, you will be checked-in in a hotel, where you can unwind yourself and get freshened up for the rest of the day. Come evening, you will be free to take a walk along the narrow, yet bustling lanes of Leh Market and explore the local life of this city. Before returning back to the hotel for your overnight stay, you can visit the ancient Leh Mosque and the sacred Jokhang Gompa. Built by Mughal emperor Aurangzeb as a treaty to save the Ladakhi rulers, the Leh Mosque is a testimony to the communal harmony that exists in Ladakh. With the architecture of this mosque in total sync with the monasteries, it truly showcases the peace and brotherhood around the vicinity. The Jokhang Gompa is one of the newest establishments in the list of religious places to visit in Ladakh. Built in 1957, it is revered as the ‘Spiritual Heart of Leh’ or the ‘Soma Gompa’, and was built by artists and craftsmen from Nepal. After 7 amazing days of this Magical Ladakh Tour from Srinagar, today you will be visiting the mesmeric Pangong Tso Lake in Ladakh. Flowing gorgeously through the Indo-China Border, this magical lake is one of the major attractions of all the Leh Ladakh Tour Packages. On your way to the Pangong Tso Lake, you will be passing through the towering Chang La Pass at a height of 18,000ft above the sea level, and can also visit the historic Shey Palace and Gompa. Arriving at the lakeside, you will be free to explore its enchanting charm followed by checking-in into a campsite to spend overnight. Seated gracefully on a hillock, this ancient structure was once the official resident of the Ladakhi royal families. On a visit to the Shey Palace, you can also witness a 7.5m gold-plated stature of the Maitryea Buddha within the main complex. A true treasure trove for the visitors to Ladakh, this magical lake is known for its celestial beauty and appeal! Perched at a height of 14,000ft, this serene water reservoir flows across the Indo-China Border; with most of it in China, Pangong Tso Lake overlooks the Spangmik Glacier and the astounding Pangong Ranges of the Indian Himalayas. Following today’s breakfast, you will be driven back to Leh. Arriving in the city, you will be checked-in into a hotel for your dinner and overnight stay. Today morning, after completing your morning meal, you will be picked up from the Leh hotel. Post this, our tour guides or representatives will drive you to the Leh Airport for your onward journey. With your drop at the airport, this fun-frolic and exciting Magical Ladakh Tour from Srinagar will come to an end.